After making this card, I listed the products that I used and saw that the word "garden" was in several of the products! So, I called this my Garden Thank You. It is for a customer who placed an order. That lovely texture on the left side was made by using the Garden Trellis Textured Impressions Embossing Folder. I ran the folder through the Big Shot with my Berry Burst card stock. The beautiful rose was cut using the Rose Garden Thinlits. I ran it through my big shot using two colors: Berry Burst and Powder Pink. Then I laid the pieces upside down on my Silicone Craft Sheet, made sure they were all in the right places, and then used my Stampin' Dimensionals in all the right places (seams) and adhered it to my card. On the right side of the front, there is a lovely print from the Petal Garden Designer Series Paper Stack. My sentiment is from the Rose Wonder stamp set, and it is stamped in Berry Burst and die cut with one of the Rose Garden Thinlits. I hope you enjoyed looking today! Thank you for taking the time to leave me a comment- I really love seeing that I have some! 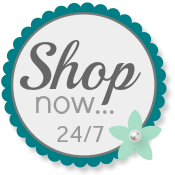 Please use my Online Store to order your own Stampin' Up! products. This is a beautiful card and thanks for sharing such clear instructions! It is fun to see the Pals cards each week. I am glad you share your work with us. Thank you, Patricia! I appreciate the time you took to comment! Please come back again soon!